Pull a knob on the vintage cigarette machine and you may pick up a new habit - buying art. The Art-o-Mat offers miniature paintings, sculpture and other tiny trinkets for not much more than a pack of Parliaments. The concept has hooked accidental art investors with refurbished vending machines in art galleries, coffee shops and grocery stores nationwide. "We're wanting to reach quality investors who haven't taken art seriously before, and to support artists trying to make a living," said founding artist Clark Whittington. He sold his own artwork in the first Art-o-Mat in 1997 in a Winston-Salem, N.C., gallery. The project now includes more than 40 rehabilitated cigarette machines, including prime spots in the Chicago Department of Cultural Affairs, the Whitney Museum of American Art in New York City, and the Museum of Contemporary Art in Los Angeles. About 300 artists worldwide contribute to the project. In a Philadelphia Whole Foods grocery store, an Art-o-Mat decorated with a blue celestial-themed painting by Whittington stands just inside the front door between boxes of honeydew melons and shopping carts. Customers can select pocket-sized paintings, magnets, glassware, African bronze sculptures and something labeled "goat milk soap" created by 20 artists whose work is stocked in the machine. Brett Mapp, the store's community liaison, said about $2,000 worth of art has been sold through the Art-o-Mat since its arrival in October. Buyers are diverse. "They're very excited and they usually come back to show us what they got," Mapp said, while restocking the machine with white boxes wrapped in cellophane, each the size of a pack of cigarettes. When he pulls open the machine, it still smells vaguely like tobacco. Mobiles by Raleigh, N.C., artist Chris Stanford were the most popular pieces during the holidays, when people bought them as stocking stuffers, Mapp said. Each Art-o-Mat selection costs $5; half goes directly to the artist, $1.50 to the host and $1 to Whittington for machine maintenance. Whittington, 36, said he hopes the machines inspire people to make the leap from Art-o-Mat's kitschy-cool to serious art collecting. While some buyers have commissioned larger works from artists whose work they found through Art-o-Mat, the majority simply want more of the miniature pieces. One North Carolina woman has collected more than 200 works featuring faces, Whittington said. "People who like to collect art can have a nice collection for a very modest investment ... people in very small apartments who don't have a lot of wall space," said artist Bob Ziller, who stocks a machine at the Beehive Southside, a Pittsburgh coffee shop. Art curator Heather McBride recently bought a painted wooden block by North Carolina artist Nicolette Carter from an Art-o-Mat in the Asheville Art Museum's gift shop in Asheville, N.C. Now, she wants to put an Art-o-Mat in the William King Regional Art Center in Abingdon, Va., where she works. 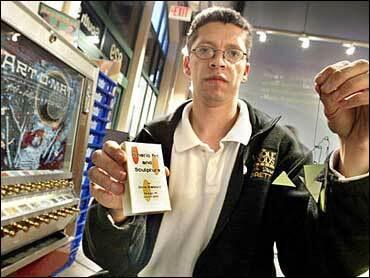 "I didn't even make it into the museum, I was so taken with the Art-o-Mat," said McBride, 31. "I was blockaded, not by the size of the machine, but by my immediate emotional attachment to it."